Christmas Countdown 2012: 28 days! If you’re of a certain age, it was a sure sign of Christmas when the Wonderful World of Disney aired one of their various holiday specials. 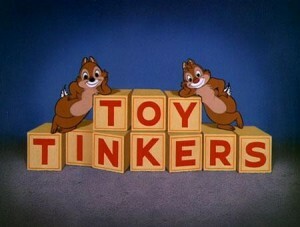 Toy Tinkers, a delightful 1949 holiday cartoon starring Donald Duck and featuring mischevious chipmunks Chip ‘n’ Dale was usually part of these Disney specials.